Gold stripe 16x19-32 oz/doz 100% Cotton Bar towels highly absorbent terry towels used in restaurants for wiping and cleaning purposes. 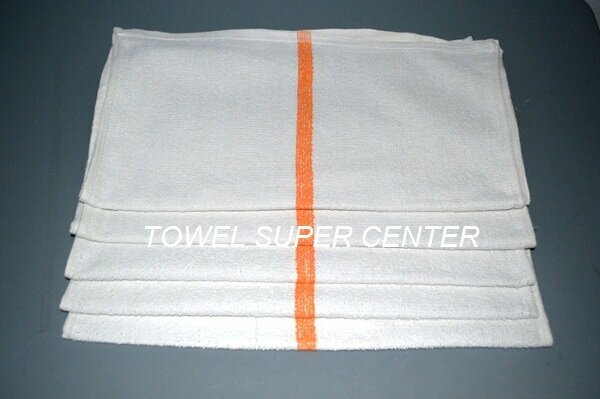 Wholesale towels prices from Towel Super Center. Let’s face it, spilled drinks can cause one hefty mess. When your business fixates primary on drinks, a spill or two is bound to happen. Don’t let splashes of liquid on the countertops slow down your workers or patrons. Our 100% cotton gold stripe bar mops are specially crafted to clean up messes with a quick swipe. With 16” by 19” dimensions, cleaning up the bar is easy. Wipe up spills conveniently with proportions perfectly fit for mopping up messes. On nights when your bar or pub is extra packed, our towels are designed to keep up with the fast-paced rhythm, displaying an attractive gold stripe while they work. Smoothness: You don’t want your employees handling harsh abrasive materials all day long. Luckily, our 100% cotton towels provide a soft, smooth experience when handled. Don’t be fooled by the fluffy material — these towels are powerful and strong, too. Soaking-Power: Not only is cotton smooth, but it’s also packed with super absorbent qualities. Our gold stripe bar mops are built to mop up your messes without leaving any liquid or odors behind. Stability: Our 100% cotton towels are strong, low maintenance and sturdy enough to provide you with the stability you need. You don’t want to spend money on additional orders of towels after a few uses once they begin to fall apart. Our towels provide a high sense of reliability, so you can ensure a long-lasting product. Not only are our gold stripe bar mops practical, but they’re attractive, as well. Liven up your bar counters with a slight hint of gold. Cleaning up messes doesn’t have to look messy — with a dash of color, your employees will look professional yet trendy while mopping up spills. Dirty looking rags are a thing of the past. Washcloths are a necessity for many businesses and industries, and thus commonly line a variety of establishments. Don’t settle for the mundane — add a sense of style to your counter with stunning gold stripe bar mops. Shop with Towel Super Center and let the savings begin today!